We had a couple of earthquakes in western Turkey today (in the Aegean Sea offshore of the Island of Lesbos, part of Greece). The M 6.3 earthquake shows evidence for extension (normal fault), based on the moment tensor (read below). 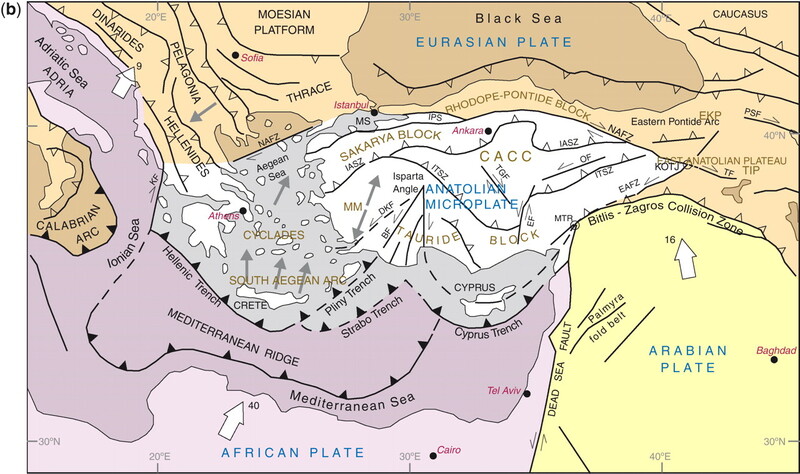 The tectonics here are dominated by the compressional tectonics related to (1) the Alpide Belt, a convergent plate boundary formed in the Cenozoic that extends from Australia to Morocco and (2) the North Anatolia fault, a strike-slip fault system that strikes along northern Turkey and extends into Greece and the Aegean Sea. 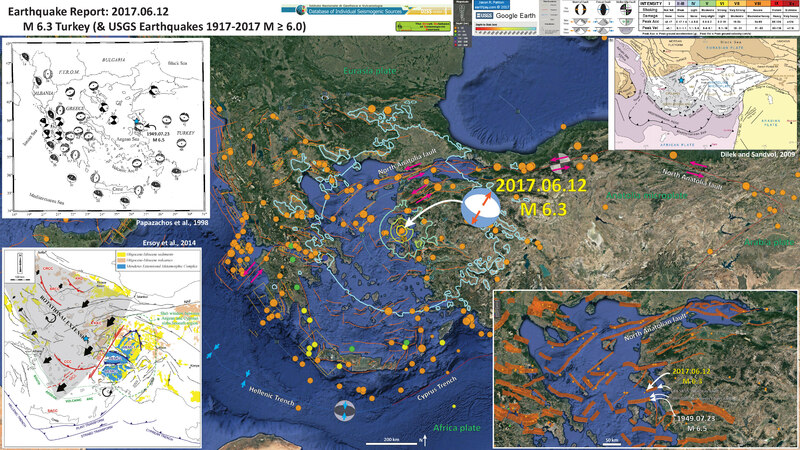 There is a series of normal faults in this region of the north Aegean Sea and today’s earthquakes are likely associated with that extensional regime. The M 6.3 epicenter plots near the Magiras fault, though the strike of the fault is different from the orientation of the moment tensor. Perhaps the fault is not optimally aligned to the modern tectonic strain. There was an earthquake on 1949.07.23 that had a similarly oriented fault plane solution (showing northeast-southwest extension), which probably occurred on the Northern Chios fault. See below (Papazachos et al., 1998). I plot the seismicity from the past month, with color representing depth and diameter representing magnitude (see legend). I also include USGS seismicity from 1917-2017 for earthquakes with M ≥ 6.0. I include faults included in two fault databases. Faults in Italy are from the Instituto Nazionale di Geofisica e Vulcanologia Database of Individual Seismogenic Sources (DISS; Basili et al., 2008; DISS Working Group, 2015). This DISS is available online here. 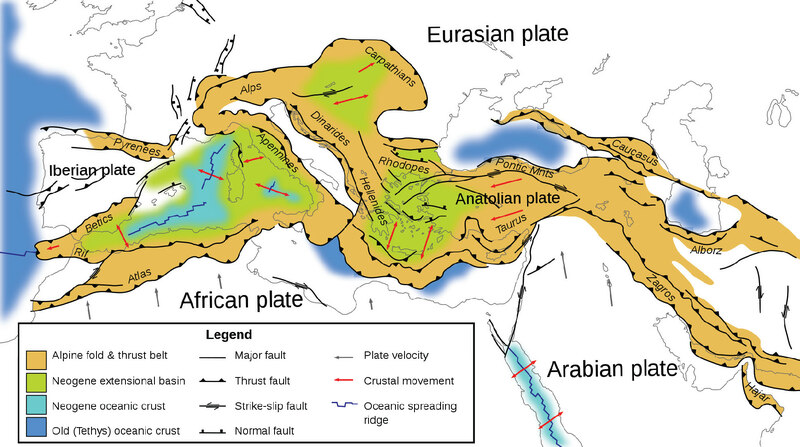 The faults in Greece are from the Greek Satabase of Seismogenic Sources (GreDaSS; Caputo et al., 2012). The GreDaSS is available online here. In the upper right corner is a regional tectonic map from Dilek and Sandvol (2009). This shows all the major tectonic plate boundary faults, as well as some of the major intraplate faults for this region. Reverse/Thrust faults are labeled with triangles on the upthrown (hanging wall) side of the fault. strike slip faults show relative motion arrows on either sides of the fault. The different plates and microplates are colored. I place a cyan star in the general location of today’s earthquake (also placed in the other inset figures). In the upper left corner is a map that shows focal mechanisms for historic earthquakes in this region. Note the focal mechanism for the 1949 earthquake and compare this with the M 6.3 earthquake moment tensor from today. In the lower right corner I include a larger scale view of the seismicity and faults displayed in the main map. I here also include the fault planes from the active fault databases (orange rectilinear polygons). These polygons show how different faults dip in different directions. The strike slip faults have more narrow polygons becuase they dip more vertically than the normal and thrust/reverse faults. I label the two faults mentioned above (possibly related to the 2017 M 6.3 and 1949 M 6.5 earthquakes), the Magiras and Northern Chios faults (Caputo et al., 2012). In the lower left corner is a figure from Ersoy et al. (2014). This shows their interpretation of the geodynamics of the Aegean Sea. They hypothesize that this region is rotating in a clockwise fashion, leading to extension in western Turkey and the northern Aegean Sea. The 1949 and 2017 earthquake fault plane solutions (focal mechanisma and moment tensors) are oriented correctly with this model. Here is a great map from Ersoy et al. (2014) that shows the geologic map of the region. Faults are shown also. Today’s earthquakes happened in the northwest corner of the figure 2 inset rectangle. Tectonostratigraphic units and major tectonic elements of the Aegean Extensional Province (compiled from1/500,000 scaled geological maps of Greece (IGME) and Turkey (MTA), Okay and Tüysüz, 1999; Ring et al., 2001, 2010; Candan et al., 2005; van Hinsbergen et al., 2005; Ersoy and Palmer, 2013). CRCC: Central Rhodope, SRCC: Southern Rhodope, KCC: Kazdağ, CCC: Cycladic, SAC: South Aegean (Crete) core complexes. KKD: Kesebir–Kardamos Dome. MEMC1 and MEMC2 refer to first- and second-stage development of theMenderes Extensional Metamorphic Complex (MEMC). VİAS: Vardar–İzmir–Ankara suture zone, NAF: North Anatolian Fault Zone. This is the Ersoy et al. (2014) map showing their interpretation of the modern deformation in the northern Aegean Sea and western Turkey. Geological map showing the distribution of the Menderes Extensional Metamorphic Complex (MEMC), Oligocene–Miocene volcanic and sedimentary units and volcanic centers in the Aegean Extensional Province (compiled from geological maps of Greece (IGME) and Turkey (MTA), and adapted from Ersoy and Palmer, 2013). Extensional deformation field with rotation (rotational extension) is shown with gray field, and simplified from Brun and Sokoutis (2012), Kissel et al. (2003) and van Hinsbergen and Schmid (2012). İzmir–Balıkesir Transfer zone (İBTZ) give the outer limit for the rotational extension, and also limit of ellipsoidal structure of the MEMC. MEMC developed in two stages: the first one was accommodated during early Miocene by the Simav Detachment Fault (SDF) in the north; and the second one developed during Middle Miocene along the Gediz (Alaşehir) Detachment Fault (GDF) and Küçük Menderes Detachment Fault (KMDF). Extensional detachments were also accommodated by strike-slip movement along the İBTZ (Ersoy et al., 2011) and Uşak–Muğla Transfer Zone (Çemen et al., 2006; Karaoğlu and Helvacı, 2012). Other main core complexes in the Aegean, the Central Rhodope (CRCC), Southern Rhodope (SRCC), Kesebir–Kardamos Dome (KKD) and Cycladic (CCC) Core Complexes are also shown. The area bordered with dashed green line represents the surface trace of the asthenospheric window between the Aegean and Cyprean subducted slabs (Biryol et al., 2011; de Boorder et al., 1998). See text for detail. Mantle flow pattern at Aegean scale powered by slab rollback in rotation around vertical axis located at Scutary-Pec (Albania). A: Map view of fl ow lines above (red) and below (blue) slab. B: Three-dimensional sketch showing how slab tear may accommodate slab rotation. Mantle fl ow above and below slab in red and blue, respectively. Yellow arrows show crustal stretching. The following three figures are from Dilek and Sandvol, 2006. The locations of the cross sections are shown on the map as orange lines. Cross section G-G’ is located in the region of today’s earthquake. Here is the map (Dilek and Sandvol, 2006). I include the figure caption below in blockquote. Here are cross sections A-D (Dilek and Sandvol, 2006). I include the figure caption below in blockquote. Here is another cross section that shows the temporal evolution of the tectonics of this region in the area of cross section G-G’ above (Dilek and Sandvol, 2009).